Media captionNicola Sturgeon: "It is now up to us to honour those who went before and win our country’s independence." 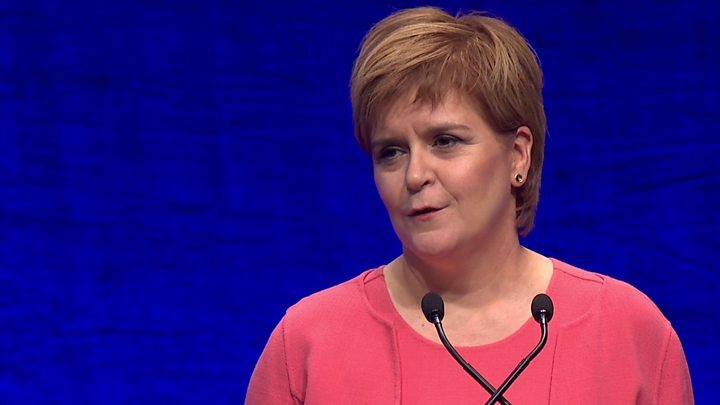 Nicola Sturgeon has called for "pragmatism and patience" from independence supporters in her SNP conference speech. The Scottish first minister said she was "more confident than ever" that Scotland would become independent. She added that members must "wait for the fog of Brexit to clear" and work to win over people who voted No in 2014. Ms Sturgeon also announced new policies on nursing, infrastructure, fair work and support for the homeless. The first minister was speaking on the final day of the SNP's three-day conference in Glasgow. She used her speech to hit out at "unfolding calamity" and "despair" at Westminster, contrasting this by painting an independent Scotland as "a beacon of progressive values". The SNP leader kicked off the conference by announcing that the party's 35 MPs at Westminster would vote in favour of a new referendum on Brexit, were such a question to be tabled at Parliament. And she closed it with a speech also packed with constitutional arguments, describing Brexit as a "serious problem" and repeatedly promoting the cause of independence. Image caption Nicola Sturgeon: "Never, ever, let anyone tell us that Scotland doesn’t have the talent and resources to be a successful independent country." Ms Sturgeon hailed the "passion" of independence supporters, nodding to the tens of thousands who marched through Edinburgh the day before the conference began. And she acknowledged the frustration that has been voiced by some campaigners over the fact that plans for a fresh referendum have not been forthcoming. She said: "Our job is to take that passion and blend it with pragmatism, perseverance and patience to persuade those not yet persuaded. "If we do that, then believe me - the momentum for independence will be unstoppable." In essence, Ms Sturgeon was telling her party two things from an SNP point of view. One, that passion alone is insufficient to achieve their objective. They must operate with a calm, temperate approach. They must be prepared to see the alternative view - to acknowledge and understand those who dislike independence. Secondly, she was making plain that an independence referendum must be deferred - at least until there is clarity over Brexit and possibly substantially beyond that. She was addressing an audience who yearn for independence. They want it tonight, if not sooner. And yet her underlying tone was all about elongation of time scales. Ms Sturgeon went on to say that "the future relationship between the UK and the EU will determine the context in which Scotland would become independent". She said: "But as we wait - impatiently, at times, I know - for this phase of negotiations to conclude and for the fog of Brexit to clear, be in no doubt about this. "The last two years have shown why Scotland needs to be independent. And I am more confident than ever that Scotland will be independent." The UK government has placed itself in opposition to a second referendum either on independence or on Brexit. The prime minister's official spokeswoman said Scotland "had an independence referendum four years ago and voted decisively to remain in the UK", adding that "now is not the time" for a fresh vote. She also called on the UK government to halt the rollout of Universal Credit "now", saying the policy was leaving people unable to eat and urging ministers to "find some compassion". Ms Sturgeon said the Westminster administration was a "shambles" which "stumbles from disaster to disaster", saying that "a political system that throws up Jacob Rees-Mogg and Boris Johnson as contenders for Prime Minister has clearly gone very badly wrong". Paraphrasing Winston Churchill while decrying Brexiteer "ideologues", she said that "never has so much been lost by so many to satisfy so few". And she warned any parties "itching to open up our NHS as part of a trade deal with Donald Trump" to "prepare for the political fight of your lives". Earlier on Tuesday, the Scottish government's Brexit secretary, Mike Russell, also urged activists to be patient over a second independence referendum, which he said should only take place when voters are "persuaded, ready and determined to win". Mr Russell had earlier been confronted by an SNP councillor at a fringe event who said members were "very frustrated with constantly being told to just wait", saying there was "a sense that time is slipping away". The MSP said: "Our job as a party and as a government is to both make sure that Scotland flourishes, no matter the circumstances but also to ensure that - at the right moment - the choice of independence can be made. "The right moment - not the most comfortable moment or the moment that best relieves our natural impatience. The moment at which our country is persuaded, ready and determined to win." What are other parties saying? The Scottish Conservatives said that while Ms Sturgeon had called for "patience" from her supporters, "most people lost patience with the SNP a long time ago". MSP Annie Wells said: "Astonishingly, in a speech littered with references to independence, there was just a glancing reference to education. "It was a staggering omission and it tells you all you need to know. Education isn't her number one priority - the only priority the SNP has is separating our country in two." And Scottish Labour leader Richard Leonard said Ms Sturgeon had "delivered plenty of rhetoric for the party faithful but dodged any detail on the new economic prospectus for separation". He added: "The so called 'Growth Commission' - in reality a cuts commission - has been the elephant in the room at the SNP conference. The first minister could not bear to tell her activists that her new plan for independence means a decade of unprecedented austerity." Scottish Green MSP Mark Ruskell said that "independence in the EU is the right choice for Scotland", saying his party would "redouble efforts to build a convincing case for this alongside the SNP". And Lib Dem MSP Alex Cole-Hamilton said Ms Sturgeon "needs to stop trying to turn Brexit into the break-up of the UK".